There was plenty of new machinery to see at Lamma 2016, held in mid-January at the Peterborough Showground. 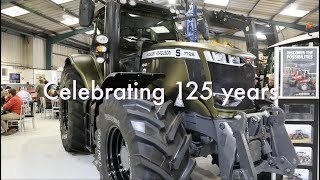 Taking place two months after the huge German Agritechnica event, considered a world stage for new product launches by many manufacturers, the show was well timed to provide an opportunity for machinery to receive its UK premiere. David Williams reports. Lamma is traditionally a cold and wet event and, while it remained dry for the duration, temperatures didn’t disappoint with a particularly hard frost at the start of day two. Indoor stands, particularly those with heating, reported two busy days while most agreed that the mood among visitors was optimistic for the coming harvest and that sales representatives and advisers were kept busy dealing with enquiries for every type of product. Precision farming technology featured throughout the show, on machinery and implement stands as well as those of specialist suppliers and the trend toward increased use of the systems shows no sign of abating as growers look for more efficiencies in their operations. Celebrating 20 years of the Case IH Quadtrac on the company’s stand meant a very large cake had to be provided to feed all those present. Pictured cutting the cake is Helen Rainthorpe who farms in Lincolnshire and who organised the world-record breaking Quadtrac working day during 2012. With her is Case IH vice president for Europe, Africa and the Middle East Matthew Foster (left) and Case IH marketing manager for the UK Charles Blessley. Claydon’s new TerraStar high-speed shallow stubble cultivator is designed to create an ideal tilth to encourage establishment of grass weeds, and especially black-grass. Work rates up to 90ha (225 acres) per day are claimed for the 6m tool, based on a typical working speed of 9mph (15kph). Fuel use is minimal, to achieve a 30mm tilth and Claydon points out that the finish is ideal for later movement with its straw rake to encourage further flushes of weeds. Chopping and incorporation of residues is also a key application and the level finish created means its use for seedbed finishing is ideal. It folds to 2.8m for transport and the price is from 15,000. A highlight among the implements displayed was a new brand of British-made plough. Suffolk-based Agri-Hire has been a main dealer for Dowdeswell ploughs for many years, and has seen demand increase recently so, when the manufacturer ceased trading in 2015, the dealer was keen to find a replacement of equivalent quality. “With our experience manufacturing heavy-duty agricultural machinery for many years, we have been able to build our own plough frames,” explained managing director Tim Hubert. “We have an excellent relationship with the parts division of Dowdeswell and components remain available so we have combined our frame with the wearing parts which we would struggle to manufacture ourselves and are offering a plough of equivalent quality to those we have been selling, and we have incorporated some improvements too. Farmers value the British-made tag on farm equipment and we are delighted that the Hubert Plough range will fill a gap left by Dowdeswell within the industry.” Tim went on to explain that he will offer three models including the 2141, rated up to 300hp and for in-furrow working only; the 2145, capable of working in and out of the furrow and also rated to 300hp, and the 2170 on-land plough for the largest tractors which is rated to 600hp. The 2145 with 6f and a 2-year warranty is priced at 22,000. Vredestein enjoyed a busy event with a stand located close to a main entrance and plenty of new products displayed. New innovations included the Traxion Harvest harvester tyre designed to run at low pressures during cyclic field operations. The example on display was a 650-75R32 but larger 800-65R32 versions are expected to be most popular, while 900-60R38 tyres are due to become available later. 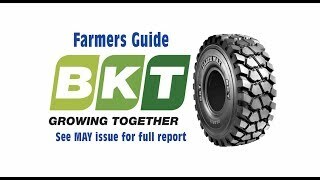 “These are designed for all sorts of large self-propelled machines including combine, forage and sugar beet harvesters,” explained agricultural tyre specialist Ed Lonergan. Also on display were new Endurion telehandler tyres designed to provide a long working life even when used primarily on hard surfaces. Rated for 50kph, they are available in all common 20 and 24-inch telehandler sizes and, despite being shown for the first time at Lamma, are available for the coming season. Pictured on the stand wrapped up against the cold weather are the show team. John Deere UK’s 50th anniversary celebrations kicked off at Lamma, and will continue throughout the year with a major event planned near to the company’s Langar, Notts headquarters for September. One of the first John Deere tractors imported by the company to the UK and which usually lives at Langar was this 4020 Diesel, displayed alongside the latest 9RX rubber-tracked crawler providing a contrast as to what was considered state-of-the-art in 1967, with the latest innovations available now. Both machines appeared to receive equal amounts of attention at the event. Polaris has launched several new models including this entry-level Sportsman 450, which replaces the ETX325cc machine, and is equipped with a 570cc power unit. Polaris district sales manager for the North, Richard Coleby, who is pictured with marketing manager Sarah Johnston, explained that there is significant demand for a competitively priced but capable ATV, with a slow-revving fuel efficient engine. CVT transmission provides ease of use and flexibility and the new machine is easier to ride and more nimble than the Sportsman 570. Prices for the new models with 4wd start at 5,299 while the 570 with manual steering costs 5,999. The 2wd version is priced at 4,999. Other news from Polaris included the availability of homologated T-specification machines from the factory for road use. This option is available for selected popular models. On the Maschio stand were members of the Maschio team and product manager David Day reported an exceptionally busy two days with lots of interest in the wide range of power harrows and drills as well as the latest flail mowers. David is pictured (left) with the Maschio Dama combination drill which has electronic drive and offers variable seed rate on the move, automatically controlled through a GPS system. “It is a step up from a standard power harrow combination drill for those wanting greater precision of plant establishment,” said David. With David (centre) is Maschio Gaspardo representative Carlo Facchini and Opico Maschio territory manager John Hulland. Gregoire Besson and Rabe products were displayed alongside those of Sulky UK, following the recent tie up between the companies which involves sharing Gregoire Besson’s Bourne UK headquarters for administration, storage and distribution. Sales staff of the two companies will market both brands adding economy of scale to both operations. Pictured on the stand with the new Gregoire Besson R6 plough are members of main dealer P Tuckwell’s team (l-r) Sam Body and Steve Buckett (Great Dunmow, Essex), Sam Barton (Maulden, Beds), Tim Thornton (Rayleigh) and eastern area sales manager for Gregoire Besson and Rabe, Harvey Sherwin. One of Rabe’s new products attracting interest was the semi-mounted Kormoran PLV180 plough, which is rated for tractors up to 600hp and for in-furrow and on-land operation. It was previewed in 2015 but is now available and creating considerable interest said Harvey Sherwin. Chris is pictured (right), next to Lutterworth, Leics-based farmer and contractor Alan Lewis, Caroline Bunning and service manager and product support specialist Robert Bunning. A new product which has been added to AVR’s potato handling range is the CSB 2600 reception hopper, which was being displayed for the first time. The company has also added an extending crop elevator, for use with all crops including cereals and expects both additions to the range to prove popular with new and existing customers. On the same stand was a new attachment for the Dezeure transfer trailers. Replacing the standard tailgate a crop cleaner reduces the amount of dirt transported back to store, improving transport efficiency and reducing cleaning needed in the yard. Removed dirt is caught in a chassis-mounted hopper and spread on the field during the trailer’s return to the harvester, allowing the user to return the dirt to the field from which it originated and comply with soil hygiene regulations. A new ‘Black-edition’ front loader option was launched by Alo at the event. In sleek black paint the loader features silver parallel linkages but there is the option to have them painted to match the tractor. A multi-coupler hydraulic connector is standard, while hydraulic locking of the attachment pins, replacing the usual hand lever system, adds 459. LED lights are also fitted, over and above the specification of the standard loader, as is the Soft Drive accumulator-type suspension system. The Black edition Q46 loader, with a 3.75m lift height is 6,070 compared with 5,620 for the standard version and the larger 4.5m Q76 loader, which lifts up to 2.1t at the bucket, is priced at 8,470. “We are selling considerably more of the larger loaders recently as bigger tractors are used for more handling tasks,” explained Quicke technical support manager Graham Gould who is pictured with the new high specification loader. Twose displayed updated TP series hedgecutters for the first time. Replacing the TF and previous TP ranges the new models feature revised styling and a new slide-mounted head. Low pressure hydraulic and cable controls were used previously but electronics and a faster acting hydraulic system are used on the new models. Reach has been increased by over 500mm on most versions. TP range oil coolers are relocated lower in the frame improving balance and stability and increasing visibility. Twose director of sales and marketing Tim Coleridge, who is pictured with the new model, said he expects the improvements to appeal to larger farms and contractors using the machines in demanding environments. They will be available from late March. Claas precision farming product manager for the UK, Edward Miller, is pictured with a new iPad-based implement control and task management system. The iPad links wirelessly to the tractor’s Isobus connector through which it picks up the control and monitoring systems. “Customers have a choice,” explained Edward. “For our Isobus green harvest implements, the user can order them without the usual Communicator terminal and use the iPad instead. Iso-Task management runs in the background which means data can be emailed directly to the farm office for ease of record keeping.” The Easi-on board app will be available to order from March and the iPad holder and other hardware needed as well as the licence is priced at approximately 1,500, but doesn’t include the iPad. Displayed by Opico was the new trailed Heva Combi-Disc cultivator. Launched last year in mounted format, the Combi-Disc offers the versatility required by progressive farms, with all working components adjustable separately to suit the conditions. A busy demonstration season resulted in many orders and managing director James Woolway commented that a great attraction is the ability to lift the subsoiling legs from work, to use the cultivator for lighter disc cultivations, where the deep working ability isn’t needed. On the new trailed machine optional front discs cut ahead of the subsoiling legs creating a slit and reducing soil disturbance and heave. Currently only a 3m version is available but the range will be increased. A fitting kit to allow the Opico Variocast 16, which comes with a hydraulic-driven fan, to be mounted on the 6.3m HeVa Disc Rollers was shown,with primary demand expected for cover crops. The shallow disc cultivator will operate at high speeds allowing land to be tilled quickly to encourage black-grass and other grass weeds to chit, and the seeder unit allows establishment of cover crops at the same time. The new seeder is capable of applying at rates of up to 80kg/ha while the high capacity fan easily keeps the long, large diameter pipes fed with air to transport larger seeds used in cover crops such as peas. The Variocast seeder and mounting kit is priced at 8,732 while the Disc roller costs 38,669. On the Manitou stand a preview example of a new Gehl loader was generating enquiries. Available for delivery during the summer, the compact articulated range is expected to appeal to livestock farmers as well as for general farm and yard tasks. “We are specialists in materials handling products and the new Gehl 650 and 750 models fill a gap in our range while the number of enquiries at the show mean we are expecting a busy autumn demonstrating,” commented marketing manager Paul Bidwell. The Manitou UK team is pictured with the new Gehl loader at the event (l-r) David Clark, Owen Buttle, Andrew Dixon, Richard Brocksopp, Peter Smyth, John Concha, Katie Hughes and Paul Bidwell. Agricultural tyre and wheel specialist and leading Honda ATV main dealer Fieldens WTA Ltd reported a busy event, with many enquiries regarding tyre and wheel options for tractors, trailers, harvesters and sprayers. “There is considerable interest in upgrading wheels and tyres where there are new options available,” explained managing director Neil Rosenthal. “We offer a full package including manufacturing bespoke wheel equipment to suit the application and with our team’s experience of the industry, as well as our competitive pricing, we are usually the first point of contact for users and dealers. The Honda ATVs continue to be popular too, and there has been particular interest in the latest models added to the line-up in 2015. They are ideal for use in the recent wet weather conditions when travelling off-road has demanded the light ground pressure they offer.” Part of the Fieldens team at the event is pictured; (l-r) Honda ATV sales manager Keith Collins, agricultural tyre specialist Dave Ingham and Neil. Sumo’s new toolbar drill system provides a greater number of options within its drill range with DD and DTS variants available in trailed, mounted or toolbar formats. Available now, working widths include 3m in a rigid mounted version, folding mounted from 4-8m and trailed from 4-9m. A new stainless steel front hopper has been developed by the company, and uses the in-house Orga metering system to feed the rear toolbar seeding units but it is also available separately for use with precision drills as well as for fertiliser applications. Drill specialist Will Wainwright commented that the toolbar’s better weight distribution is attractive as it permits improved manoeuvrability and allows the operator to run the tractor at reduced weight, as a front counter-balance isn’t needed. “For zero-till applications, growers are trying to manage headland movements better and keep tractor weights down to reduce soil damage and compaction,” he explained. “Another benefit is the cost-effective package price as the front hopper and toolbar are cheaper to purchase than an equivalent trailed drill with integrated hopper. It costs 56,775 for a grain-only 4m DD drill whereas the 4m folding toolbar and hopper package provides a saving of 16,000, which is quite considerable,” he added. With the new 4m DD toolbar drill (top) are drill specialist Will Wainwright (left) and design engineer James Falkingham. Pictured (above) with Sumo’s ever-popular ‘Sumo Man and his partner Tyson the dog’ are (l-r) James Falkingham, sales manager Pip Snaith, Will Wainwright, and marketing and events co-ordinator Rachael Walshaw. Bullock Tillage, based in Malvern, Worcs, displayed its range of competitively priced cultivation equipment. “We are in a market where wheat is at a low price resulting in lower margins and this has meant a need for modern machinery capable of achieving the results needed but at a price which can be justified by growers,” explained partner Nigel Bullock, who is pictured with the machines. “We have had considerable interest at the show, mainly in the tine cultivators which are very reasonably priced.” Within the range is the Discsub which has large leading discs followed by loosening legs and a packer. This is designed to cope with large amounts of residue including cover crops while loosening the soil down to 8-10 inches. The large leading discs create an opening for the tines and chop through the trash. Wearing parts common to other brands of machine are used for ease of supply and the legs are Hardox. The price is 5,900. Quivogne UK marketing director Ben Clowes is pictured on the company’s stand with a header trailer from Cochet, which has recently been added to the brands represented by the company. Demand for trailers to safely handle the large headers which are becoming increasingly popular has encouraged the company to look for equipment with all the necessary features and at a competitive price, explained Ben, and the Cochet trailers are available for headers from 5m with a single axle to 13m with two axles and linked steering which follows the tractor’s track. Generous under-beam ground clearance and rear axle oscillation provides a smooth ride through uneven field gateways and 235mm commercial tyres are fitted. LED lights are standard and hydraulic or overrun braking is available. The header is attached securely in seconds using a V-locking system. Two new telescopic handlers were previewed by Deutz-Fahr at the event, with production due to commence later this year. The new 30.6 Compact offers a 2,800kg maximum lift capacity and 5.8m maximum lift height. Power is provided by a 3.6-litre 100hp Deutz engine meeting Tier 4 final emission regulations. A hydrostatic transmission offering transport speeds up to 32kph is standard. Tyres are 405/70-20 but 400/70-24 radials are an optional upgrade. Later this year a larger wheeled version will join the line-up offering speeds up to 40kph and with a more powerful engine.